9/14/13 How was your Week? The Chase for the Sprint Cup starts Sunday in Joliet Illinois. On a side note the track isn’t to far from where Dan the Man lives but sadly he’s not going to the race. NASCAR added Jeff Gordon as the 13th driver to the Chase; there are normally only 12. Gordon was added because of some controversies between Joey Logano and David Gilliland. It seems as if Gilliland was going to give Logano a position on the race track that would’ve allowed Logano to qualify for the Chase; knocking Gordon out. 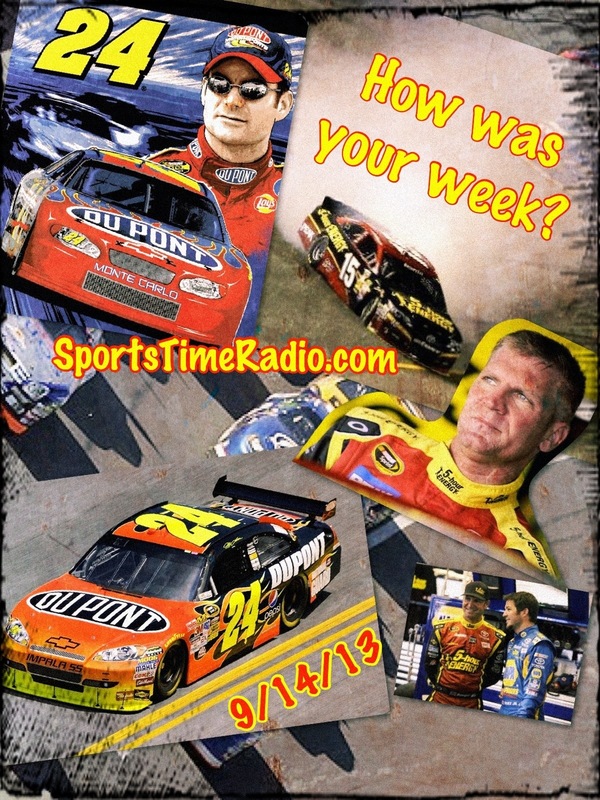 There was also the issue earlier in the week with Michael Waltrip Racing (M.R.I.). Clint Bowyer (Dan the Man’s favorite driver) spun towards the end of the race with Ryan Newman leading. The caution flag came out and after pit stops Bowyer’s teammate Martin Truex Jr. was ahead of Newman and at the end of the race was one of the 12 drivers who made the Chase for the Sprint Cup. After the race NASCAR reviewed the radio communication between Bowyer and his pit crew and it was decided that Bowyer’s spin was intentional; so Truex would have a chance to get into the Chase. All three M. R. I. drivers (Bowyer, Truex and Brian Vickers) were penalized 50 points and put on probation. The penalty knocked Truex out of the Chase and gave Newman the last spot in the Chase. Gordon was also in the running for a spot in the Chase when all this stuff went on and after a review of the Logano/Gilliland situation Gordon was added as the 13th driver in the Chase. I think NASCAR handled the situation correctly and Gordon should’ve been allowed to compete for the championship. Once the Chase gets started a lot of these issues will go away and they’ll be back to racing. The National League wild card race seems to be heating up and every expert I’ve heard talk about it is on the Washington Nationals band wagon. I believe the Nationals where 5 games behind the Cincinnati Reds coming into play today (Saturday). 5 games are a lot to make up with just about 15 games to go, but they’ve been the hottest team all month and have given themselves a chance. The American League wild card is an even bigger mess. It looks like either the Texas Rangers or the Oakland A’s will take one of the wild card spots, but the second spot is up for grab. You could take 4 or 5 teams and throw their name in a hat for that second spot. The Tampa Bay Rays, Baltimore Orioles, New York Yankees, Cleveland Indians and even the Kansas City Royals are trying to find a way to take the second wild card spot. It should make the final couple of weeks of the baseball season fun to watch. We’re doing an NFL preview show on Sunday mornings from 10:00 a.m. – 12:00 p.m. central standard time. You can find it on Blog Talk Radio and the name of the show is NFL Preview Week 2. Just like last season we;re making picks on the games and last week went like this; Mr. Fantasy and I went 10 – 5 and Dan the Man was 9 – 6. Week 2 started Thursday night with the New England Patriots beating the New York Jets 13 – 10. If you want to know if we think your favorite team will win listen in. Will also talk about injuries, fantasy advise and anything else we think of that might affect the game. We don’t talk a lot about the PGA tour on the show, but last night (Friday) I had to mentioned that Jim Furyk shot a 59 Friday at the BMW championship in Lake Forest Illinois. This is the 6th time in PGA history that a 59 has been carded. Furyk need a birdie on the 18th hole to get to 59 and he hit his second shot out of the fairway to just a few feet of the hole. Of course he made the putt to get around in 59. It’s not a huge sports topic but I thought it was something that deserves mentioning.